Hey Working Daughter, you know, you are kind of awesome, right? Wait, what? You don’t know that? It’s true. And I really want you to know that. 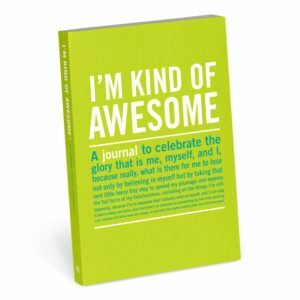 So, in honor of you and all you do, and to celebrate National Family Caregiver’s Month, we’re giving away 5 copies of the I’m Kind of Awesome Mini Inner-Truth™ Journal from Knock Knock. Pardon the pun, but these pocket-sized journals are awesome. 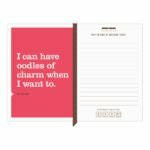 They give you a place to write down all the ways you are awesome. Plus, they are loaded with motivational, non-cheesy quotes to inspire you. Working daughter, you need one of these journals! No guilt. No worries. No flaws. Just pure awesome. To enter the giveaway, leave me a comment telling me something that makes you awesome – big or small. Are you caring for your elderly parent, plus kids, plus holding down a job? You’re awesome! Did you leave the house showered and with matching socks more than once this week? Awesome! Did you manage to keep your thoughts to yourself and spare someone else’s feelings? That’s pretty awesome! Did you help someone else, make someone smile, start a business, turn a profit, run 5 miles? All awesome! So don’t hold back. Brag a little. Leave us a comment by midnight EST on November 27 and we will use Randompicker.com to choose a winner. I am family caregiver and a working caregiver…what could be more awesome?! It doesn’t get much more awesome Kim! I am a long distance family caregiver and I would love to gift my sister who quit her job to be Mom’s full time care giver. How awesome of you Jane! Caregiver for my mom, who lives with us. I cant think of a better to spend the holidays! Left my job to care for Dad in our home while raising 2 kids, loving my hubby, caring for my in-laws nearby and launching my own biz and blog. That feels like awesome sauce to me! That is indeed awesome sauce! I am a caregiver, mom, grandma, and frirnd trying to juggle all my roles. Trust me, I have had some tough moments, but many, many rewards as well! You sound kind of awesome Sheila! Yes you are Donna! WOW! Caring for my mom for the past 17 years after she suffered a stroke. Finished my master’s degree as a Physician Assistant while doing it. Left my job after she suffered another stroke to continue a good quality of life for her because she means the world to me. You are totally awesome Josephine! I am long-distance caregiver for mom, who has early mid-stage dementia. Went to see her at Thanksgiving. Discovered she was using antacid as candy/lozenge–several daily. After trying to explain to her, I took it away with me. She was very angry. I stayed calm and loving and shifted focus to something positive.